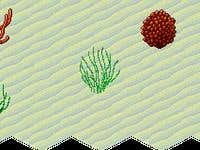 Sea bottom tile map with corals and seaweed. Over the past 8+ years, I have worked in three wide areas: Graphic Design, Development and Administrative support. My core competences are in: Animation, C# Programming, Data Visualization, Data Analysis, Data Processing, ETL, ExpressionEngine, Graphic Design, Illustration, Microsoft Office Automation, NinjaTrader, NinjaScript, PHP Development, Quantitative Analysis, Qualitative Analysis, VBA, WordPress.